I was pleased to see my older diagram used here in a critique of Noah Smith. 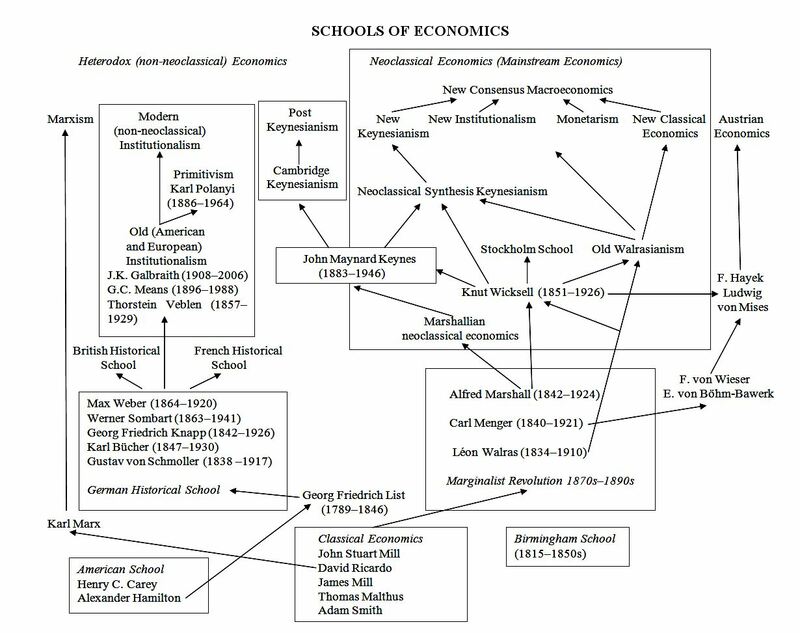 Some people pointed out that Knut Wicksell, given his influence, needs to be included in the diagram. That is true. I have included Knut Wicksell, the American School (Henry C. Carey and Alexander Hamilton), Georg Friedrich List, the Birmingham School, the Stockholm School, and Karl Polanyi and Primitivism. On Knut Wicksell, see here and here. For good discussion of Wicksell’s theories, see Axel Leijonhufvud “The Wicksell Connection: Variations on a Theme” (1981), Colin Rogers’ Money, Interest and Capital: A Study in the Foundations of Monetary Theory (1989), and David Laidler’s Fabricating the Keynesian Revolution (1999). Knut Wicksell’s development of the loanable funds theory with the natural rate of interest has been one of his most influential contributions to economics. For Wicksell a market economy has a long-run tendency to monetary equilibrium, and his monetary equilibrium approach was adopted and developed in diverse ways by many important schools: namely, the (1) the Stockholm School; (2) the Marshallian neoclassical school, (3) the Austrians and (4) the modern New Consensus macroeconomics. Leijonhufvud, Axel. 1981. “The Wicksell Connection: Variations on a Theme,” in Axel Leijonhufvud, Information and Coordination: Essays in Macroeconomic Theory. Oxford University Press, Oxford and New York. 131–202. The lack of connection between Marx and the classical economists and the Cambridge school seems to me misleading. Apart from that, good diagram. Also, J.K. Galbraith is clearly related to both Keynes and the Post-Keynesian school. He's part of what Palley calls the "Post-Keynesian Institutionalists"
I have recently discovered another one, it is called structuralist economics. It is a Latin America based school whose economists have emphasized developmentalism, import substitution industrialization, and dependency theory. One of its more prominent exponents is José Antonio Ocampo. My diagram omits all details regarding Neoclassical and Marginalist economics, so LK's diagram nicely complements my diagram. Thanks!